Round 2 was 1500 points, Breaking point IIRC. Sadly, it looks like only two photos were taken, and both of them early. Hopefully Marcus & Blakely can fill us in on what happened--I recall that Blakely won, but like every game they've ever played, this one was extremely close! Dwarves left to right: Spearmen, Battleaxemen, Longbeards, Battleaxemen, Militia behind Militia. Orcs left to right: Orc Swordsmen, Orc Swordsmen, Orc Crossbowmen, Earth Elemental behind Orc Crossbowmen, Goblin Raiders. Marcus's positioning of the Earth Elemental would allow it to join to line on either side of the crossbowmen. Nice move. Last photo and the units are all still unengaged. Looks like the Battleaxemen on the left have been getting shot up something fierce! Definitely curious as to how Blakely eked out a win here. Thanks for posting Kevin! I can't believe I only got 2 pics of this one but once I got into the groove of the game I was enjoying myself too much - LOL Plus I would get up every half hour or so to take pics of the other games as well. This was a Breaking Point scenario at 1500 points. Here's how I remember it and it would be easiest if I started left to right based on the pics. Blakely was able to pivot those Spearmen on her left flank in such a fashion as to inherent a two's company from 2 Orc Swords. I was expecting a slow breakthrough here but one of the Orc Swords was bent on doing hardly any damage. She eventually drove that unit off with a failed red check after it had done all of 1 point of damage. The other Orc Sword unit almost made up for the shortcoming of the other, but not quite. The Spearmen took longer to kill than expected and the surviving Orc Sword unit didn't get into the rest of the fight as soon as I thought it would. The Battleaxemen next to them where the target of both my Orc Crossbows who both had a Close standing order capped at 2.5". My early ranged fire was actually pretty good and I got more damage than expected. The Crossbows on the left managed to dispatch the Battleaxemen in time once the Spearmen went down and the Orc Swords finally got the pinch (see below). The other Crossbowmen had the unsavory task of holding off the Longbeards but they held up reasonably well (with a LOT of blue card love) and even knocked the Beards into the yellow before failing a red route check. Blakely held back the other Battleaxemen unit to delay the inevitable engagement with Rocks-for-Brains but it couldn't be avoided. She also was having issues getting both Militia into the fight in time, allowing me to not worry too much about the Goblin Spears for a bit. IIRC Blakely had spent her cards elsewhere so she didn't play anything on the initial engagement. The Elemental yielded a satisfactory 3 damage on the charge to the Battleaxemen. The Dwarves needed 4s and 2s for their return swing (with no Rune) and I growled some very un-ladylike comments when they did 4 damage to the Elemental. Ack! 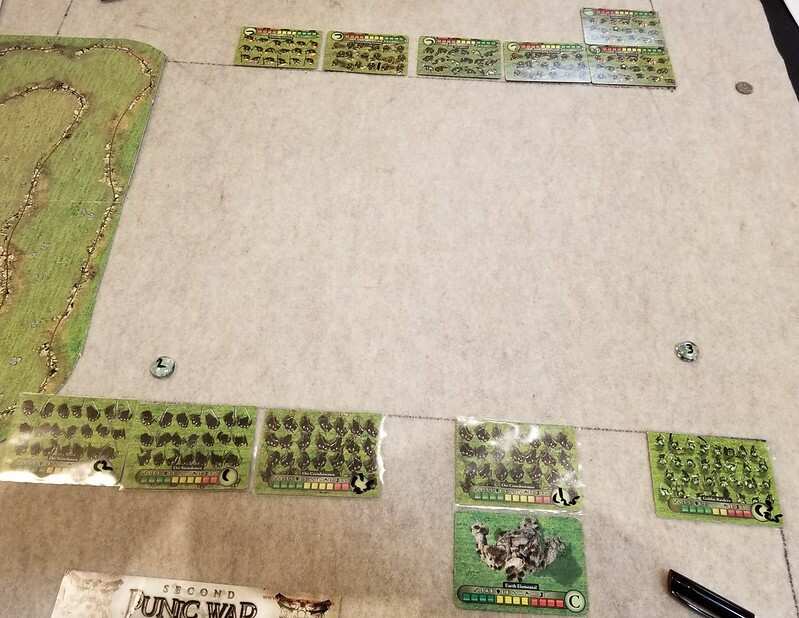 I twiddled my Goblin Spears in such a way as to draw the twos-company from both Militia units and bless their rotten, green little hearts, the Goblins not only stood firm on the charge turn, they even routed one of the Militia on the following turn! I pointed at the Dwarf Spear/Orc Sword twos-company on the far side of the table and said "Hah! I can do that too!" The Spears went down and the surviving Orc Swords (now in the yellow) where finally able to help pinch the badly beaten Batleaxemen into oblivion. The Crossbowmen where ecstatic, but the Longbeards finally trashed the Crossbowmen next to them and then they flanked the momentarily victorious Crossbowmen. 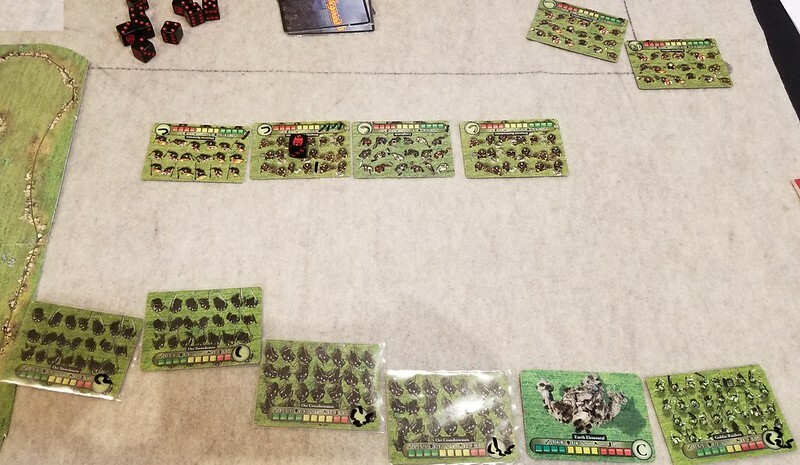 Then something wonderful happened - I played one of those hot Orc cards (can't remember which one) which put The Beards into the red and they failed their route check, running to my right and behind the Elemental. At the moment I thought this was amazing and the Crossbowmen still had 2 red boxes. Things where looking up! Rocks-for-Brains eventually stomped his Battleaxemen opponents into the dirt when they failed a red check with 1 red box remaining. However, the Elemental was now barely in the red itself. The Militia unit that remained engaged with my Goblin Spearmen eventually won their fight and then they flanked the Elemental. Neither unit did much damage to the other for the first couple turns (Militia numbers where awful and Elemental was only throwing 2 dice to the right flank). Blakely reformed the other routing Militia but they wouldn't make it back into the fight in time to do anything. So I had an Orc Sword unit and beat up Crossbowmen coming across the map while Blakely had The Beards (in bad shape with only 2 red boxes) with 2 Militia units. Now remember The Beards had run behind the Elemental when they routed, so Blakely reformed them and then had The Beards charge the Elemental's rear, creating a pinch and bringing the Elemental down. This was the breaking point so Blakely won right there. If the Elemental had not gone down there I would have won the game because The Beards where about to be flanked by my hero Crossbowmen and the game would have gone the other way. Well played Blakely, nice and tight as always! Thanks for filling in the details. I love how every time the two of you play it's this utterly brutal match that goes down to the wire! Thanks for the detailed writeup Marcus! I'm glad you remembered it so well - I tried to describe it to Eric and Kevin at dinner that night but my brain was so fried that it was something like "Dwarves fight Orcs, go bang." I've never played a breaking point game before so that was interesting, I think if it had been total warfare it would have been a tossup to see who would win.